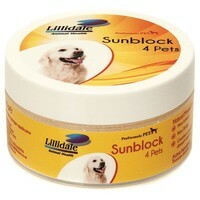 Lillidale Sunblock 4 Pets is a natural mineral powder formula that blocks all UVA and UVB rays for a minimum of 24 hours. Easy to apply with the sponge provided, the natural non-irritant formula creates a smooth coating which can’t be rubbed off easily and can be applied to all areas susceptible to sunburn, including areas that have already been damaged by the sun. Lillidale Sunblock has a non-sticky formula that does not attract dirt or dust, and since it is water resistant, it does not need to be reapplied after drinking.